2. The catalogue of Chas J Goodman, Picnic Point, Bairnsdale. 1914. They sold for 1/6 each or 12/- and 15/- per dozen. The majority of apricots on the catalogue were on apricot seedling rootstocks, however some of the varieties were for sale on plum stocks, these being recommended for planting in wetter areas. [Goodmans1914] The catalogue used American spelling for words such as color (colour) and flavor (flavour) and this has been retained. 3. Fruit grown on the "Friedenstruh Orchard" by Mr. Thiele. 5. List of wax models kept at the Scienceworks Museum. At the Scienceworks Museum, 2 Booker St Spotswood, The collection can be viewed on weekdays between 10 am and 4:30pm, by previous arrangement on 03 3924819 and ask for Liza Dale. Varieties of apricot that there is a wax replica of have [Sci] beside them. 6. NSW Department of Agriculture computer listing of stone fruit. (GBHRS) Listed as having been growing at the Granite Belt Horticultural Research Station in Qld. (Vic) Once having been held in the Victorian Dept. of Ag Research Stations. 7. [Grays] 1907 Catalogue of W G Gray, Nurseryman, Diamond Creek, Victoria. Apricots were budded on to seedling apricots and sold for 1/- each, 10/- per dozen or 3 pounds per 100. 8. [Nobelius] 1931 catalogue of C A Nobelius & Sons, Gembrook Nurseries, Emerald. The catalogue listed apricots on seedling apricot stocks but also sold apricots on peach and plum stocks. Plum stocks were recommended for growers on wet land. 10 [Frankston] Formerly grown at Frankston by the Dept of Agriculture. <Loxton> Dept of Ag, S.A. List of apricots available commercially or with scion available. Listed on 28/8/95. 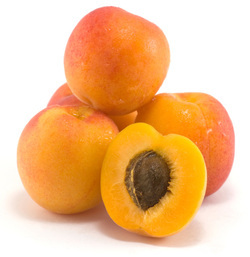 Missing apricots that there is a record of having once been grown in south-eastern Australia. Listed on 28/8/95. 78 varieties. ROYAL GEORGE Large, deep orange color; fair variety. Medium. [Goodmans1914] Medium size, one of the best late varieties. Late. SUNRISE A very large and early variety. [Goodmans1914] . Apricots are generally chip budded or T budded onto a variety of Prunus rootstocks and have been successfully grafted. Peach, apricot and in some cases myrobalan plum seedlings have been used, Marianna 2624 being most recommended (Hartmann and Kester). Marianna and myrobalan rootstocks can be easily grown from cuttings. Best success with grafting has been obtained when an established rootstock (not transplanted that winter) is used. This is then transplanted, if necessary, the following winter. Thanks to Frank Gathercole of Loxton, S.A., Sue Richards and Tania Kipping of Tatura, Vic for their assistance. Non-profit groups such as garden groups, organic groups, permaculture groups or similar are encouraged to distribute this material by computer printouts or photocopying. Groups are encouraged to make their own pamphlets to photocopy and sell for profits for their group.